*This post is brought to you by the Dollar Tree. I love Spring and Easter and pastels and jelly beans and Easter crafts and peeps and I feel like I should break out into singing “These are a few of my favorite things” from The Sound of Music. Between the newness of spring time, the gorgeous colors and flowers galore, this season presents so many reasons to fall in love with it. I’m a crafty gal who loves to entertain. But the crafts and the entertaining have to have one common trait – EASY. I don’t do difficult. Because when difficult is thrown into the picture, I am not enjoyable to be around. So I present to you today some easy Easter crafts perfect for decorating for an Easter brunch! 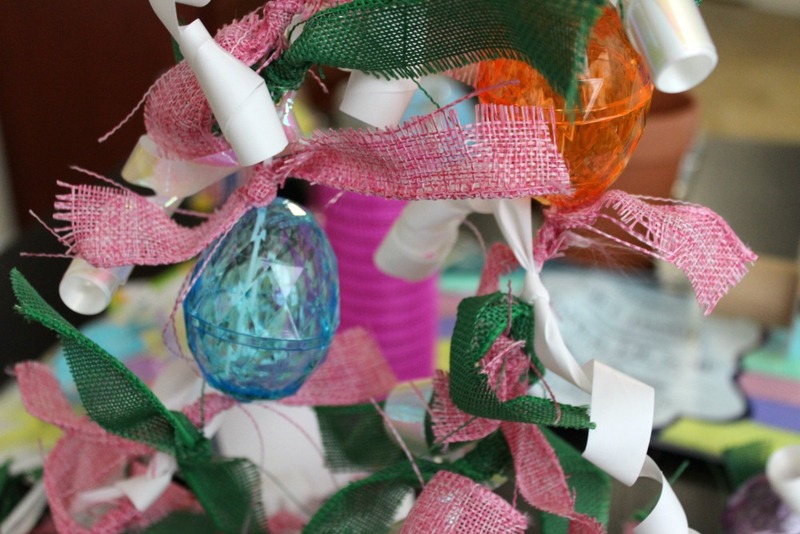 I had so much fun creating several crafts to share with you today. This post is long, so bear with me! First up, an Easter table centerpiece. This craft requires no glue. 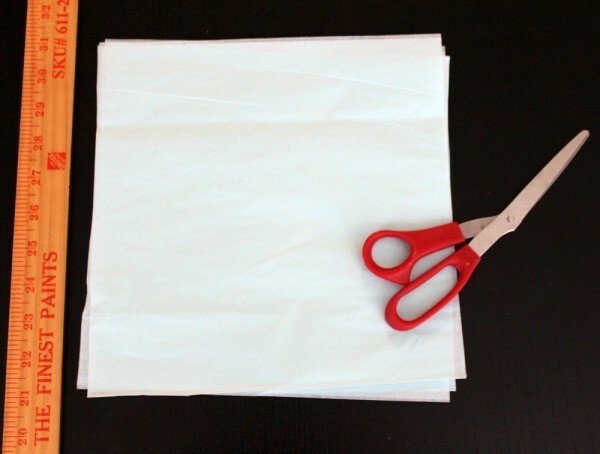 Just scissors and a few minutes of your time. I laid out several supplies and got to work. Here’s what I started with, but didn’t end up using everything pictured. 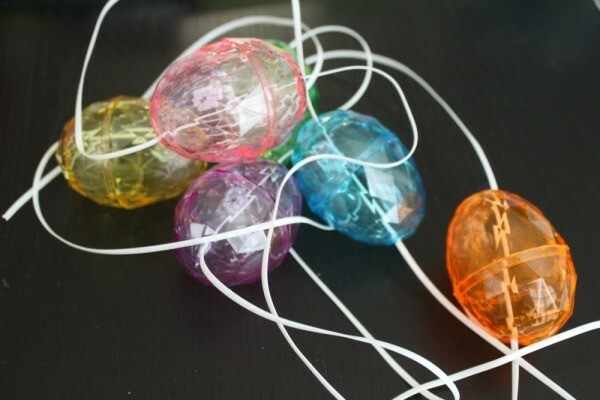 Step One: String plastic eggs onto string. The eggs already had holes in both sides so it was perfect and super easy. 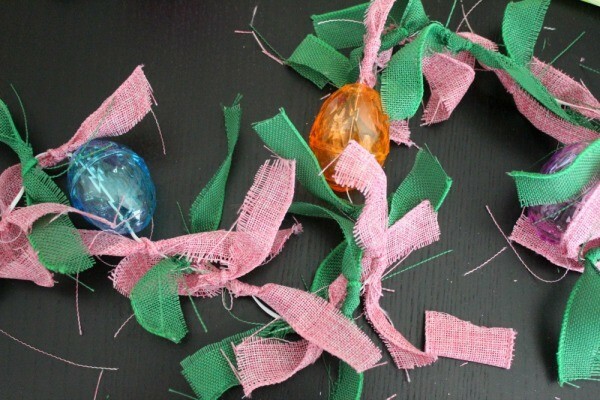 Step Two: Cut burlap ribbon in half and tie pieces to the string in between the eggs. 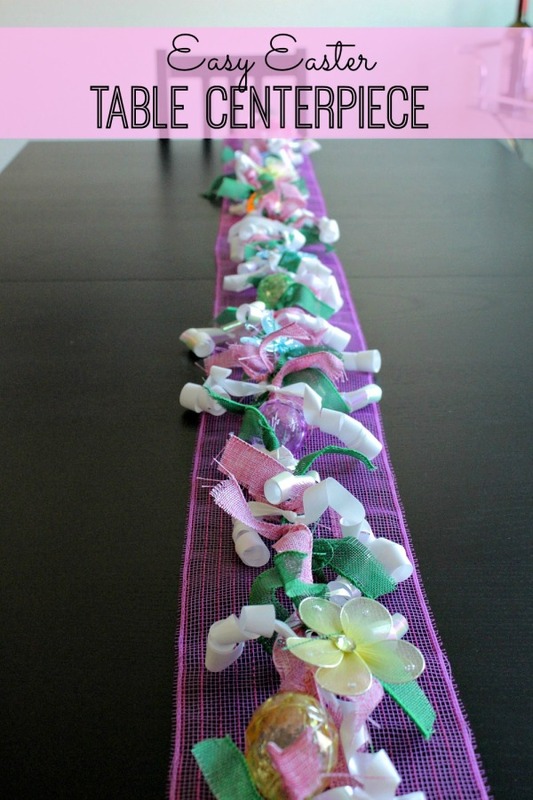 Step Three: Take apart the curly ribbon and tie pieces in between burlap ribbon onto the string. Step Four: Attach yellow flowers and blue butterflies to string. 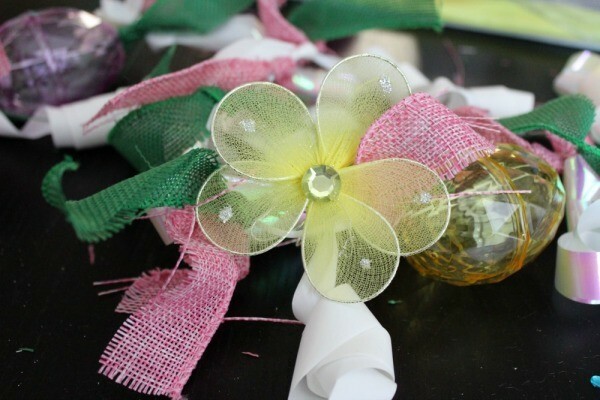 They had little wire pieces to curl around the ribbon to attach. Voila! You are done. I put down a large piece of pink mesh ribbon in the center of the table and laid the Easter centerpiece on top. I think it turned out so cute and it’s something completely original! The next Easter craft I made was so simple I just couldn’t believe it. Unfortunately I didn’t get pictures of the process, but I can promise you, you don’t need them! I took this green pail and put a piece of craft foam on the bottom. 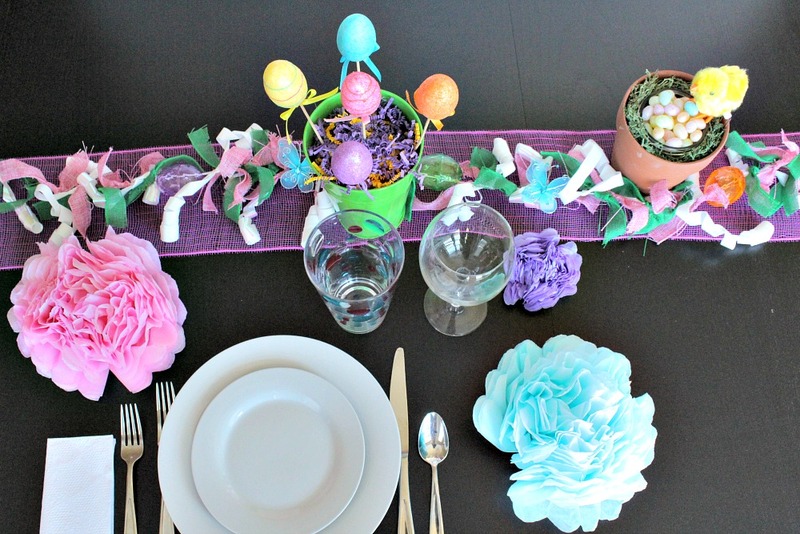 I then stuck the eggs, which are attached to sticks (you can see them in my product picture from my table centerpiece) into the craft foam. Lastly, I filled the pail with paper Easter grass to cover the foam and for a festive look. 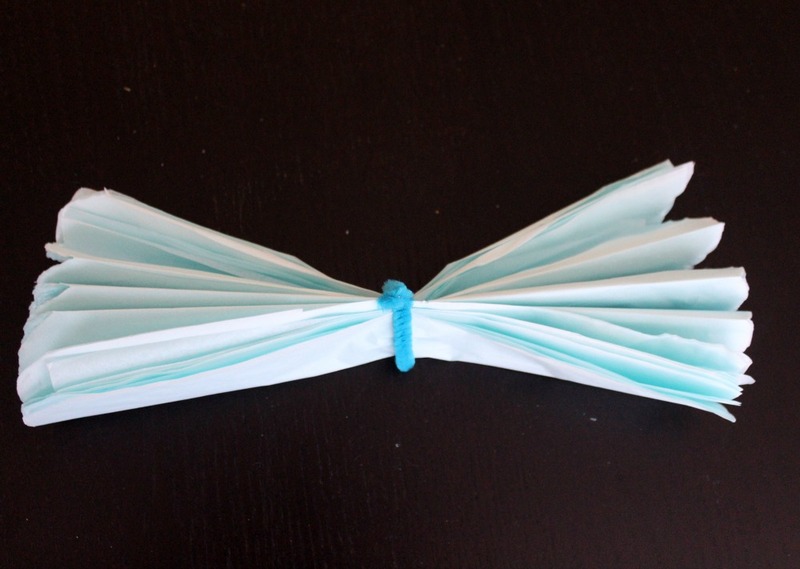 It’s another craft that required no glue and it took me 5 minutes to make. The next item I made was a little Easter Candy Dish. I took a clay pot and placed a mason jar inside. 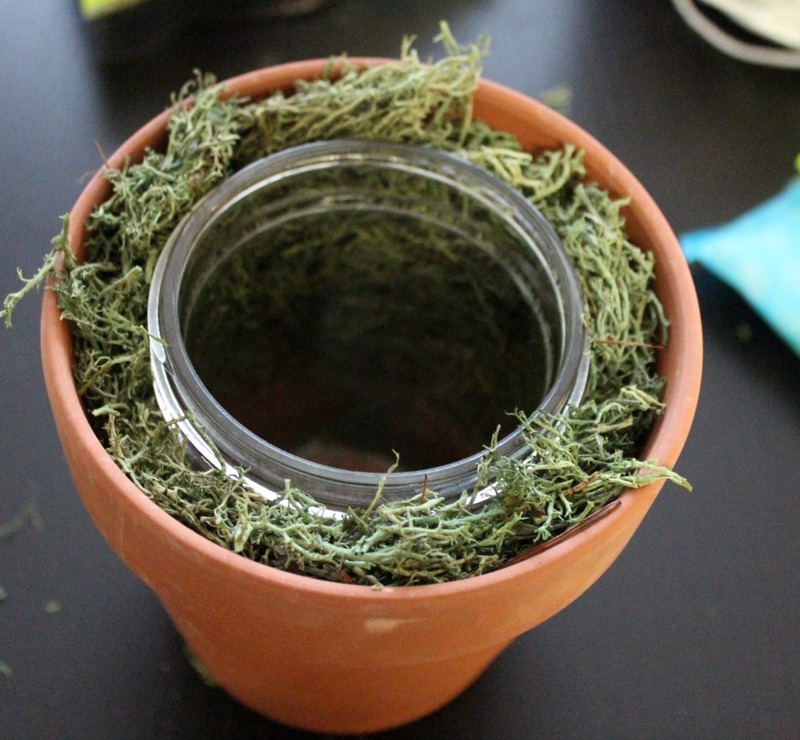 I then filled in around the mason jar with Reindeer moss. After that, I glued this cute little chicky on (well, after I played with it over and over again). Next up, fill the jar with speckled egg jelly beans. 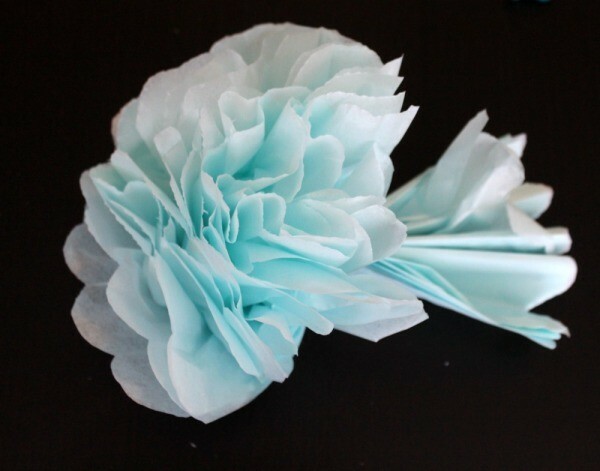 I love making tissue paper flowers. 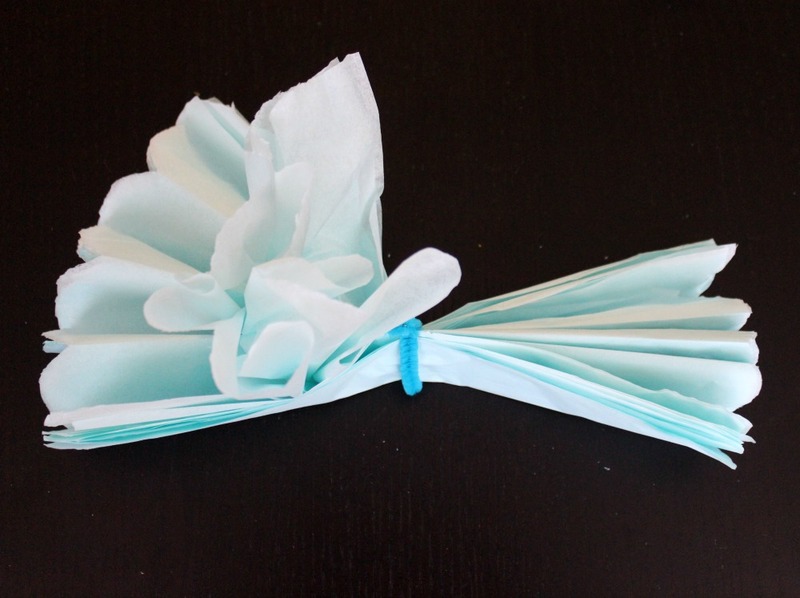 They are so easy and they can turn a table, a party or a package into something really special. Step One: For the larger flowers, I cut 10×10 inch square sheets of tissue paper. For the small flower, I did 5×5. Step Two: Stack the sheets together and fold them in accordion style. Secure with a small piece of pipe cleaner or floral wire. 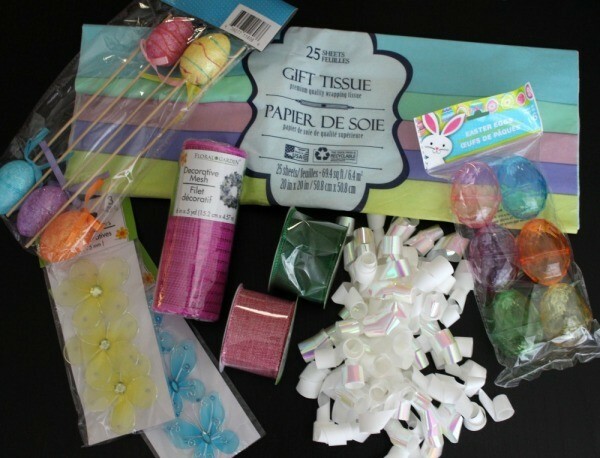 Step Three: Cut a round tip on each end of the tissue paper. 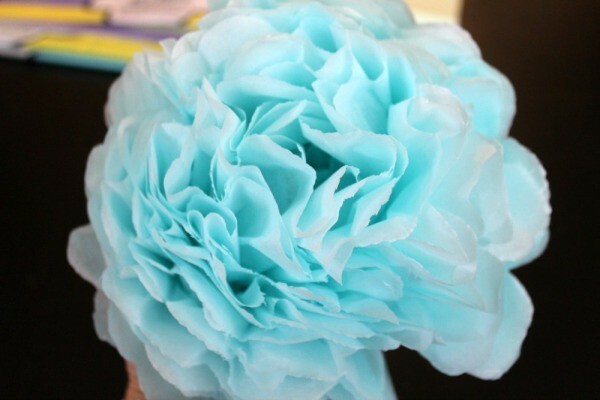 Step Four: Gently start to pull each layer of the tissue paper out to create the flower. Step Five: Fluff as needed. So there you have it! 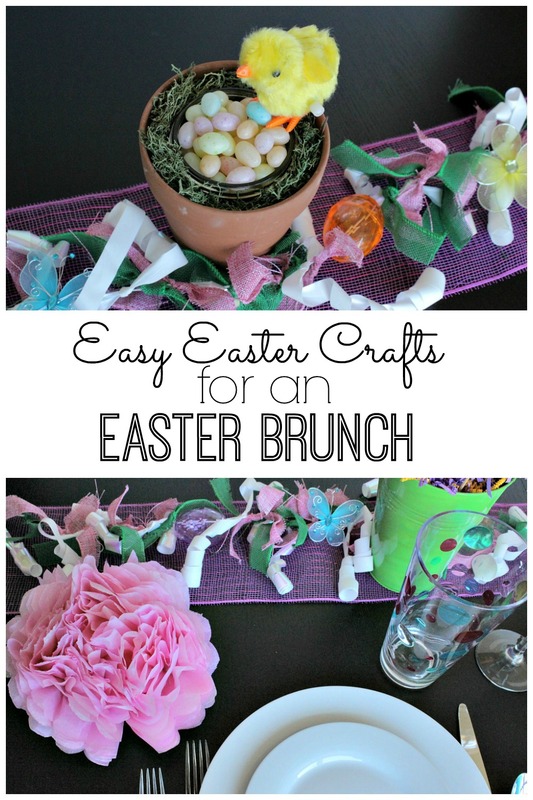 My easy Easter crafts for an Easter brunch. 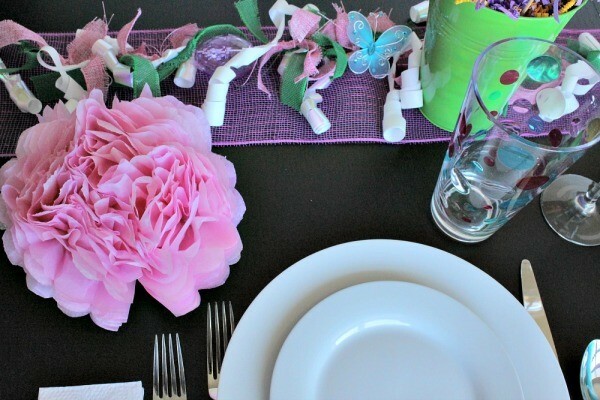 To set up my Easter brunch table, I set up the centerpiece with the mesh ribbon and Easter egg/ribbon centerpiece I made. 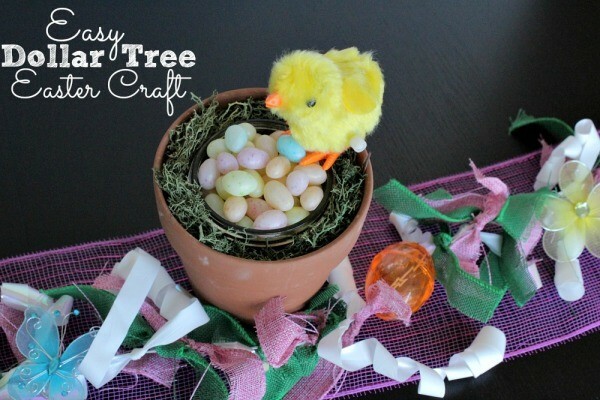 Then I added the Easter Pail and Candy Dish. 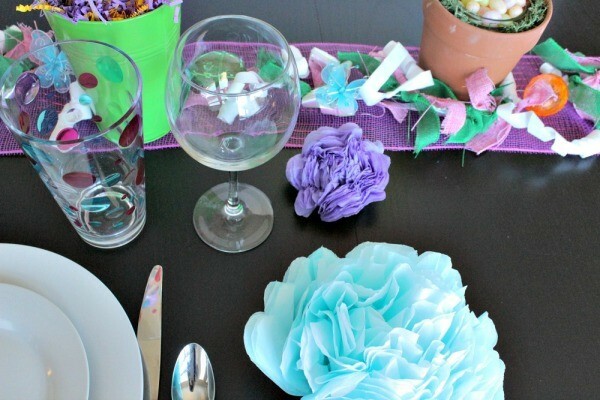 After that, I added simple white plates, silverware, cups and the tissue paper flowers. 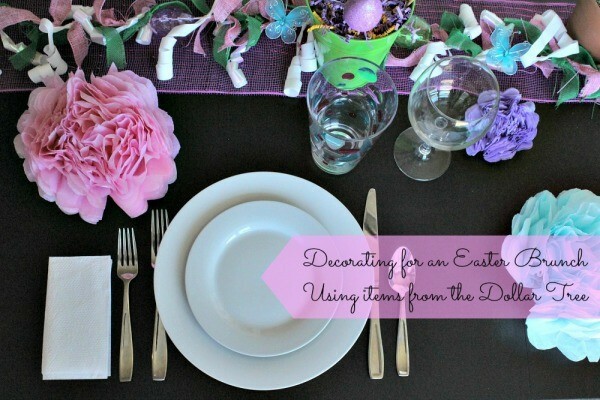 Are you planning on hosting an Easter meal? Do you get crafty around Easter time? 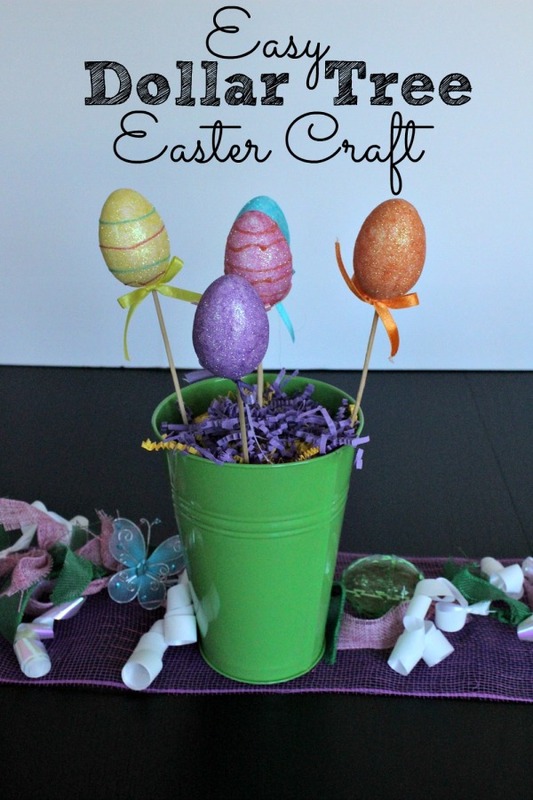 I hope these Easter crafts gave you some inspiration! Stay tuned, because starting March 16th you can vote on my craft and be entered to win a $50 Dollar Tree gift card. I’ll give you more details when the date arrives!